For those of you who don’t know. Oakland is redrawing their city council boundaries. Every 10 years, council districts are drawn to basically make sure populations are equal, around 55 thousand folks. This year District 1 (Dan Kalb), District 2 (Pat Kernighan), District 3(McElhaney) and District 5 (Gallo) have to redraw their lines to be compliant with the law. 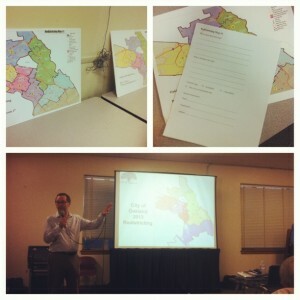 District 1 and 3 have too many folks – due to new development and housing. District 2 and 5 need more people. (ha). Although school zones are drawn along city council district lines, this will not affect school financials, attendance or curriculum. It will however effect whether or not a school board member lives in the district they represent. They may have to move in order to be up for re-election. The same goes for City Council if they happen to be drawn out of their district. They will not have to give up their seat during their current term, but they will have to move before their next election cycle. This of course means more to reps of District 2, and 6 because they are up for election next year. HA! 1. If you live along the borders between 1, 2, 3 and 5 you could be moved to another district, since those are the districts that are going to be seeing most of the changes. In maps that I have seen, it’s possible that neighborhoods in N.Oakland/Emeryville, Mosswood Park,Rose Garden, Adams Point, Jack London, East Lake, Trestle Glen, China Town might jump one from district to the next. Neighborhoods can be split or united. For example neighborhoods east of the Lake is currently split between District 2 and 5. They are looking to be united by making all of East Lake part of District 2, but will that come at the expense of splitting up another neighborhood (as in the case of one map..splitting up Adam’s Point?). There is also a possibility of uniting Maxwell Park, a strong and active neighborhood that is currently split into 3districts. 2. There is also interest in redrawing districts so that residents of the same socio-economic status can have their own voting blocks. There are at least two maps that divide or move Districts 2, 5, 6 and 7 along the 580 freeway, or into ‘hills’ vs ‘flatlands’. There have been concerns that voices that live below the freeway aren’t being heard as much as those who live in the hills. The thought is that residents with higher incomes have the most power when it comes to influencing elected officials and having council districts with mixed – economic backgrounds disenfranchises low-income communities of color. Having a district consisting only of low-income communities of color will make sure that they will always have a voice. On the other hand, opponents say that whether or not a council person pays attention to their constituents depends on THAT particular council person and where their particular interests lie. In addition opponents feel that this will further polarize the city and they DO NOT want to see the city divided into US vs THEM. Other comments or things to make note of. – According to Council President Kernighan (District 2), most of the city council don’t like the idea of splitting up districts according to socio-economic groups. She said that having mixed populations puts the onus ont he Council rep to be sensitive to the needs of their constituents at all economic levels. CM Kalb didn’t like to make a yes or no about it, though he does see merit in the argument that some groups of interest might be heard more based on voter turnout. The city staff was able to point out in District 2 the areas east and below the Lake (China Town, South LakeMerritt etc) area had a higher turnout 57% than the areas north of the Lake (Grand Lake, Lake shore etc)– 43% . Council member Brooks submitted a plan.. so did her opponent for her council seat in 2014 election. Iiiiiinnteresting! that was part of the town hall in District 1, felt that all of the council people should have submitted a map. She was also interested in how each council member feels about changes made in their district and if a neighborhood had to move under a different CM, will that CM care about their new neighborhood? What do YOU think? Hmm..? I don’t think you should stand by and let decisions be made for you. This has been a real open process and you should take advantage of it. Don’t wake up Dec. 31st talking about who is my council person.For those of you who are asking that question now —> \_ in the corner. 2. Write, call or meet with your council person. 4. Show up at Council meetings on Oct. 15, Nov. 5th. Whatever you decided to do..Do it before Oct. 15th. 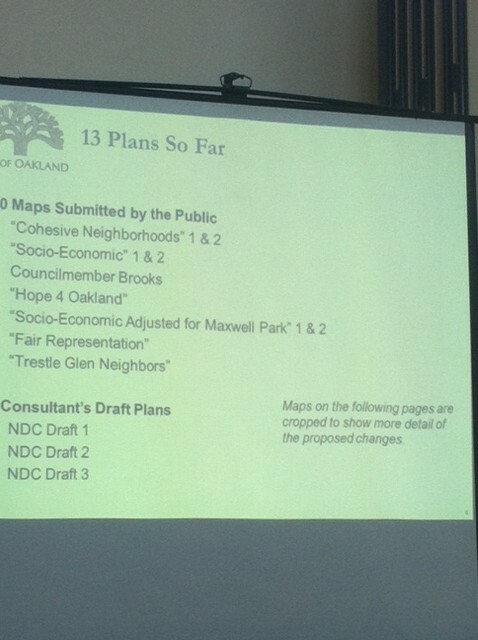 At that meeting, Council will have whittled down to two maps. So if there is one you like or dislike, you betta say something! Wait..do you have a comment? Do you want to see the city divided into socio-economic areas of interest? Do you care if your neighborhood is split? Is your neighborhood cool? What’s your City Council person’s name? 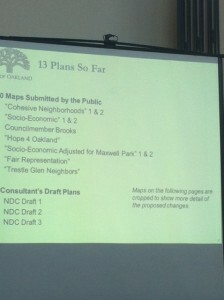 Raiders or 49ers..
One Response to Oakland Redistricting Meetings..TDL Summary.